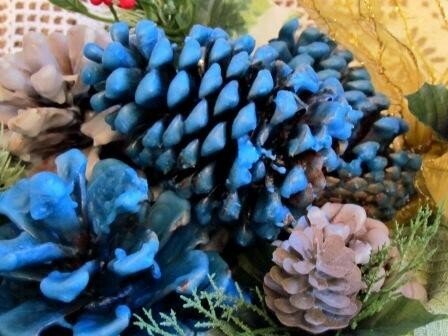 Amazingly simple to make, these beautiful firestarter wax covered pinecones make a wonderful gift! And the main ingredient can be found in huge numbers in the woods! That is totally my kind of project! For family gifts, I created an assortment of these wax covered pinecones in Christmasy colors and put them in gift baskets. A great gift for a great price! The crayons are used for color, so choose what colors that you would like your pinecones to be and prepare the crayons by removing the paper. 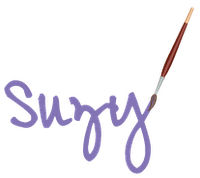 It will take 4-5 crayons per box of wax to achieve a good strong color. 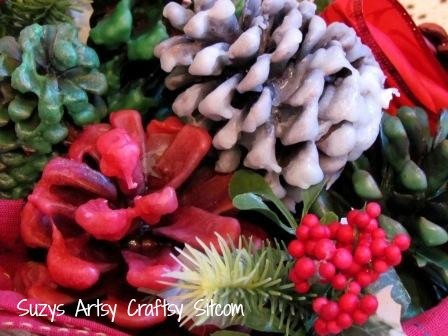 I chose to make red, green, blue and white pinecones. Start by using your double boiler or in my case, I used two sauce pans inside each other. I put about 2" of water in the bottom sauce pan and added a box of wax (cut in smaller pieces) to the top pan along with the red crayons. Allow the water to boil, and stir the wax until it has melted. Cover your workspace with wax paper. Remove the pan from the heat. Allow it to cool for a few moments, then begin dipping the pinecones in the pan, coating them with a layer of wax. I found that each pinecone will need several coats of wax and as the wax begins to cool in the pan, the coats will get thicker on your pinecones. I found that each box of wax would generally cover about 3 large pinecones and 4 smaller ones. At some point, your wax will get too cool to coat them properly. Just reheat the wax and repeat. Being the crazy thrifty person I am, I actually scraped up all the cooled puddles of wax from the wax paper and reheated them in order to get as much as I could out of each box of wax. Repeat this process for each color. Be sure to clean all your utensils carefully between each color change so as not to contaminate your new color. Remember that wax down the drain is not a good thing. In order to clean the utensils, I scraped as much as I could into the trash and then used hot water for any tiny bits left over. The baskets, kitchen towels and artificial greenery were all purchased from the Dollar Store. 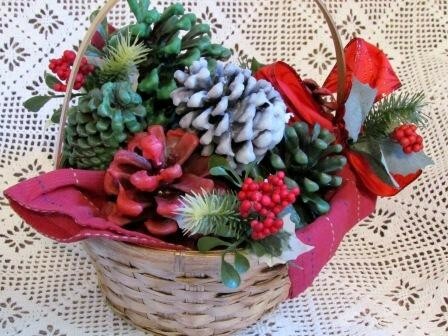 I lined the baskets with the towels and then placed the pinecones in along with the greenery for decoration. I finished the basket by tying a wired ribbon bow to the handle along with a few sprigs of artificial greenery. For gift giving, you can purchase clear bags to put your baskets in (also at the Dollar store) and tie with a bow. This makes an awesome gift. Suggestions for variations would include adding a scent to the wax or placing cinnamon sticks in the basket along with the pinecones. Since money is tight this year, this will most likely be my "go to" gift for friends and relatives. Even if they don't own a fireplace, it makes a beautiful tabletop decoration.